I've been busy with so much lately and have not had time to update my blog. I've been designing and painting new Christmas cards. A wildlife set and also a Woody and Tallulah set which are based on my two dogs and have a little touch of humour! I've also been painting, painting, painting for my online Trade Catalogue which is now up and running. This will be added to from time to time as I come up with new ideas. 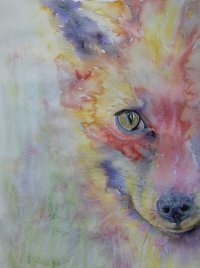 I've also entered an art competition run by Wraptious who support artists and produce their work as cushions, prints, canvases etc so if you haven't voted yet, please do. Thanks to everybody who supported me at the Oswestry Show yesterday. The next event is this coming weekend - Friday 10th - Sunday 12th August at Ellesmere Summer Festival. I'm taking part in an exhibition in the Market Hall which is part of the Summer Festival. 6 original paintings and 2 framed prints will be on sale. Please support the event. 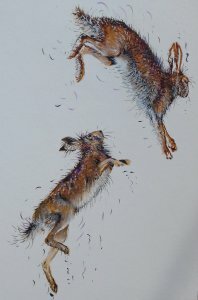 I've been working on many more originals ready for the show on 4th August - dogs, horses and the usual hares and foxes. Come along to the show, there's lots to see. 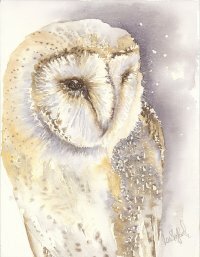 I now have my work in Galeri at Betws-y-coed and my originals and prints are proving popular which is great. The Summer Open Exhibition at Brecon where I have 3 pieces is also well underway and finishes in a couple of weeks time so well worth a visit! Hope everybody is out in the fabulous sunshine we've been having lately. Long may it last. 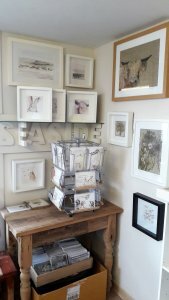 I've been working towards producing more work ready for the Summer Festival at Ellesmere. You'll find me in the Market Hall so come along and say "hello". 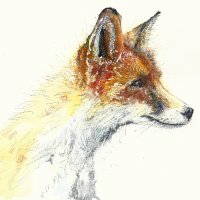 I'll have originals, prints and cards for sale - some old favourites and others new but still with a countryside theme. 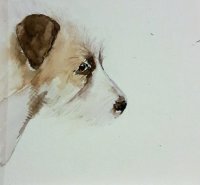 I've now finished working on producing pet portraits. 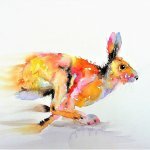 Normally priced at £120 + P&P for an A3 of one animal (mounted but unframed) I have an opening offer of £95 + P&P. This offer will run until 14th May 2018. Offer now closed. Yet another busy, busy week. Proof reading book 3 - "The Straad Pack Lose Woody in the Secret Land" and amending typos! I can't wait for it to come back from the printers. I've also completed another 2 paintings. A fox and a hare. I'm really engrossed in this new colourful style. I've nearly finished book No. 3 - Woody finally gets to meet a family of dragons living out at St Ninian's Point! It will be on sale at Mount Stuart from 23rd March 2018 with my other 2 books, The BIG Noise and the Christmas Story both of which sold out last year. I've had such fun with this book painting dragons along with the usual 4 characters. I've finished all the illustrations and text, it's just being proof read then off to the printers! I've started writing another children's book - it's called "The Straad Pack and their Christmas Story with the usual 4 characters, Rosie, Woody, Bonnie and George and maybe some new introductions. They are beginning to become wee celebrities on the island. Still more watercolours to do for the book so a while off being finished just yet but do keep an eye out for it at Mount Stuart and Ettrick Bay Café. 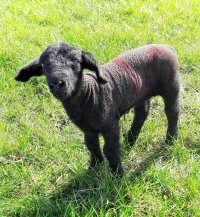 Spent a relaxing hour or so today at Straad photographing Janey's Suffolk lambs. Just so cute. Some of my art on the wall in my studio today. Time for a cuppa!! Lovely walk on the beach this morning with most of "The Straad Pack". George away on a mainland visit for a few days but back with us at the weekend!! A selection of Yennie van Oostende's work went up on the wall today! Looking great Yennie. A lot of hard work has paid off - my website is live! Time for a well deserved cuppa. 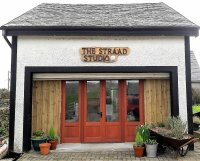 We've been working hard here at Straad to make sure my studio is ready for opening Easter weekend.